Can a dress change the world? According to Blythe Hill and her group of Dressember advocates, the answer is yes! What started as a personal style challenge for Blythe in college, has become an international movement to rescue individuals out of modern day slavery. More than 30 million people are currently enslaved worldwide and human trafficking generates approximately $150 billion a year (http://www.dressember.org/why-a-dress, https://www.ijm.org/the-problem). These numbers are staggering, leaving many of us feeling helpless to elicit any kind of change. Enter Dressember! In less than four years, Dressember advocates have raised over $3 million for grant partners such as International Justice Mission and A21, organizations that work daily to rescue and rehabilitate victims of human trafficking. So how does Dressember work? Advocates commit to wearing a dress (or tie) every day in the month of December in order to raise money and awareness for the fight against human trafficking. In this way, individuals can link arms with a community in hopes of bringing freedom to men, women, and children around the world by simply wearing a dress. An article of clothing that was once seen to many as a symbol of weakness, fragility, and inequality, becomes one of freedom, power, and dignity. To learn more about Dressember, become an advocate, or to donate to the cause, visit the Dressember website at http://www.dressember.org. Fair Trade Winds has recently partnered with Elegantees, a fair trade clothing company that rescues trafficked women in Nepal. Elegantees works with Dressember designers to create their own line of Dressember exclusive dresses. 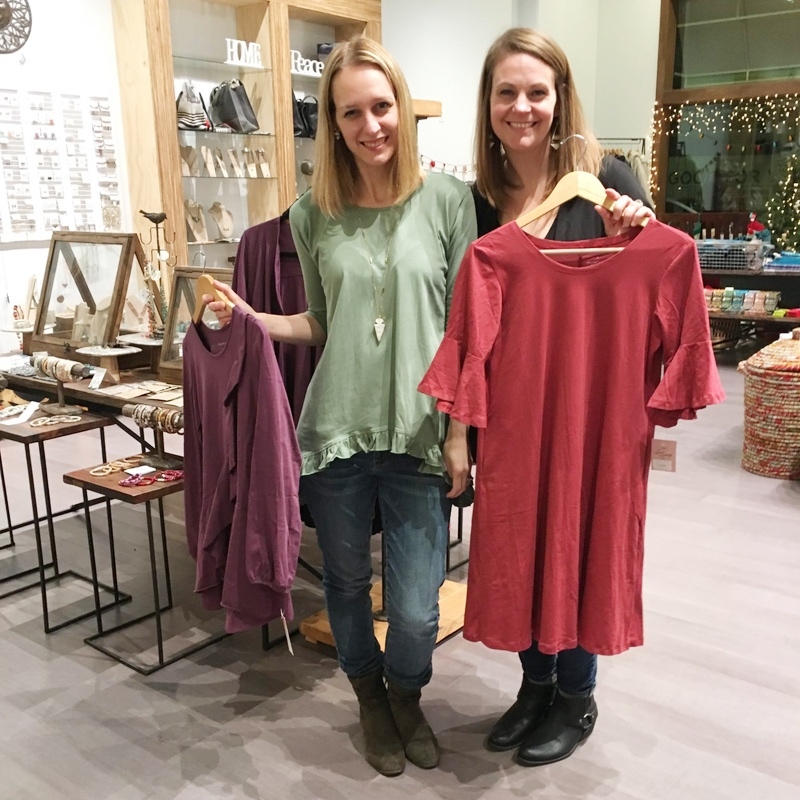 Pictured on the left is Elegantees founder, Katie Martinez, in our Fairfax store with some of the beautiful pieces made by the team in Nepal.